My pumpkin for Halloween '09. I tried to base is on an angler fish as best I could. Those things freak me the hell right out! 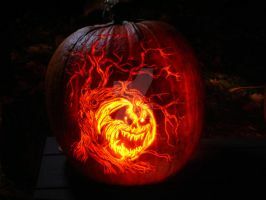 I dare you to attempt to smash this wicked pumpkin! My youngest loves this and has asked me to make one like it with her. Thanks for sharing and inspiring! Hello! I just wanted to inform you (if DA mentions hasn't done so already) that this deviation has been featured here- fav.me/d6shchc. I'm sorry if you have been notified previously. This is great, great work. You've been featured in the special Halloween edition of my Art of the Week poll! awesome, how long did it tack to do? reminds me of an anime called Bleach and it's King Fisher! Fantastic! I love the idea so much, it's quite unique. Wow, awesome work you have amazing skills.